The Department of Social Work and Social Care is delighted to present its annual conference and a series of monthly seminars at its Kingston Hill campus. Speakers at these events are leading national and international researchers, policy makers and commentators, who are invited to deliver talks on issues of topical and contemporary importance. 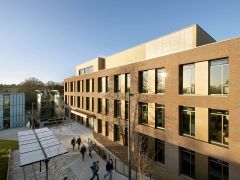 These events are CPD-certificated and open to all staff and students at Kingston University and at St George’s, University of London, staff in local social services in the statutory, voluntary and private sectors, and to service users and carers and their organisations who assist with the School’s social work education programmes. The theme of our 2018 Annual Conference was ‘Success’, highlighting stories of achievement and possibility in the fields of social work and social care. The day featured keynote presentations from Dr Ruth Allen, Chief Executive of the British Association of Social Workers, and from Dr Maryam Zanouzi, co-founder of the service user cooperative, Ginger Giraffe. We also had a lively and interesting discussion from a panel of experts, who considered what success meant in the face of multiple challenges in the sector. As usual, attendees were able to choose from a range of seminars and workshops, which this year included presentations on the BME attainment gap in higher education, Approved Mental Health Professionals and the Law, and the Happiness Project. The conference also featured two book launches: Child-Centred Social Work: Theory and Practice, by Dr Vivienne Barnes, and Complexity in Social Work, by Dr Rick Hood. In this seminar Ellen Marks, Director of Practice and Learning at PAUSE, talked about “Taking a PAUSE” – a relationship based model for working with women who have experienced recurrent removals. PAUSE works with women in a creative way to help them identify and reach their goals. At the heart of this are the relationships between PAUSE Practitioners and women, with the skills and experiences of both coming together to unlock potential. In this seminar, Professor David Shemmings discussed his groundbreaking work in the field, speaking about contemporary uses of attachment theory in child protection. There was a particular focus on tentatively recognising some of the more extreme behaviours when the attachment system is activated in children, providing an evidence-based model for practitioners who are supporting children and families in relation to current or historic neglect and abuse. In this seminar Professor Jill Manthorpe outlined some of the new subjects being taken up as safeguarding work and some longstanding subjects encountered in practice. She explored the changes that took place under the Care Act, drawing on the Social Care Workforce Research Unit’s studies of adult safeguarding over the past 15 years to examine links between policy, practice and research. This seminar presented a critical analysis of the intersection between neoliberalism and social work, with a focus on contemporary trends and debates. Dr Gurnam Singh, Principal Lecturer in Social Work at Coventry University argued that the current crisis in neoliberal economics is spurring a new political consensus on welfare and of welfare recipients. The theme of this year’s conference was ‘New Directions’, highlighting the innovative ideas and practices that are transforming the field of social work and social care. As well as keynote presentations from subject experts on topics such as systems thinking, decision-making, and therapeutic education, attendees also had a range of seminars and workshops to choose from, including wool-felting and transformative life-writing. Click on a thumbnail below to view the conference photographs. Dr Simon Duffy of the Centre for Welfare Reform was the original inventor of personal budgets and has worked closely with disabled people and families as a service provider, philosopher and writer. At this seminar he explained why he thinks the whole social care system is failing, arguing that the problem is not just about money – the sector’s problems are also political and conceptual. Families in poverty have taken the brunt of austerity measures with stringent cuts in welfare and public services having led to significant hardship for vulnerable children and families, while the numbers of children in care in England are at their highest level for twenty years, with child protection investigations and care proceedings continuing to rise. Using recent quantitative and qualitative evidence, the links between poverty, other social inequalities and child protection were highlighted in this seminar, and questions raised about the role of a child protection system that focuses on parental blame whilst ignoring fundamental structural problems and the complex ways these impact on the lives of families. A survivor of a forced marriage, Derbyshire-born Jasvinder Sanghera CBE is the founder of Karma Nirvana, a national award winning charity that supports both men and women affected by honour based abuse and forced marriages. She is a highly acclaimed international speaker and an expert advisor to the courts. Her memoir, ‘Shame’, was a Times Top 10 Bestseller. Jasvinder was pivotal to the creation of a specific UK forced marriage criminal offence in 2014. Prime Minister David Cameron stated that her work ‘turned my head on the issue of forced marriage’. Jasvinder has won much recognition for her work, including Woman of the Year in 2007, the Pride of Britain Award in 2009, and was awarded Commander of the British Empire in 2013 for her outstanding contribution for the victims of forced marriage and honour based abuse. Current social policy initiatives promote early intervention to improve the lives of disadvantaged children. Neuroscientific evidence is prominent in this discourse, creating the lustre of science, but too much has been taken on trust. The seminar presented a critique of current policy in the UK, drawing on counter-arguments from the policy discourse in the United States during the ‘decade of the brain’, updated with more recent research findings. Overall, we show that the infant brain is not readily susceptible to permanent and irreversible damage from psychosocial deprivation. Professor Sue White qualified in social work in 1984 and worked as local authority social worker and manager, mainly in statutory child care, until 1995, when following doctoral studies, she took up various university posts. For the past two years, Sue has been involved in the social work reform process in England, serving on the Social Work Task Force, and as a member of the College of Social Work Development Group and the Social Work Reform Board. Sue is currently a member of reference group for the Munro Review of child protection services in England and Chair of the Association of Professors of Social Work and Editor in Chief of Child and Family Social Work. Drawing on research conducted by the author and colleagues for the Department of Health, this seminar considers how, in an evolving legal and policy context, professionals address the complex safeguarding challenges presented by self-neglect. Suzy Braye is Emerita Professor of Social Work at the University of Sussex, and a Fellow of the Academy of Social Sciences. Her professional background is in social work, and in local authority management. She now practises as an independent consultant in adult safeguarding. As a freelance researcher on migration issues based in Munich, Germany, Professor Dr. Philip Anderson’s research focuses included the situation of Muslims in Germany; intercultural competence; the social and human rights of the undocumented; studies in London and in Munich; care of the dying; elderly migrants in Germany, and migrants with disability. Since October 2007 Dr Anderson has held the Professorship for Migration and Intercultural Social Work in the Social and Health Sciences Faculty of the University of Applied Sciences in Regensburg, Germany. He is currently researching the integration of young asylum seekers and refugees into the vocational training system. Research should underpin everything a social worker does but the challenge is how do we apply it in practice? Drawing on her most recent book, “A Practical Guide to Child Protection”, child protection consultant and trainer Joanna Nicolas discussed some of the areas of work that social workers and other professionals find the most challenging. These areas include working effectively with other agencies, working effectively with families, working with disguised compliance, the impact of neglect and getting the most out of the home visit.